Addemar Support Knowledge - How can I connect to the API? In our application you have the ability to work with our API. This API allows you work with our application outside our application. To use our API you'll need a webservice user / token, and this document describes how you need to setup this up in our application. On this page you'll get an overview of all your active user-accounts. To create a new webservice user ( or any other user ) please click the New Webservice user button. This action will open a popup where you need to define the details for this webservice user. 1. The token is auto-generated. In the description text-field you can enter the needed description for this user account. 2. Define the protocol which will be used to connect to our API. SOAP protocl is recommend. 3. The generated url which is used to connect to our API. 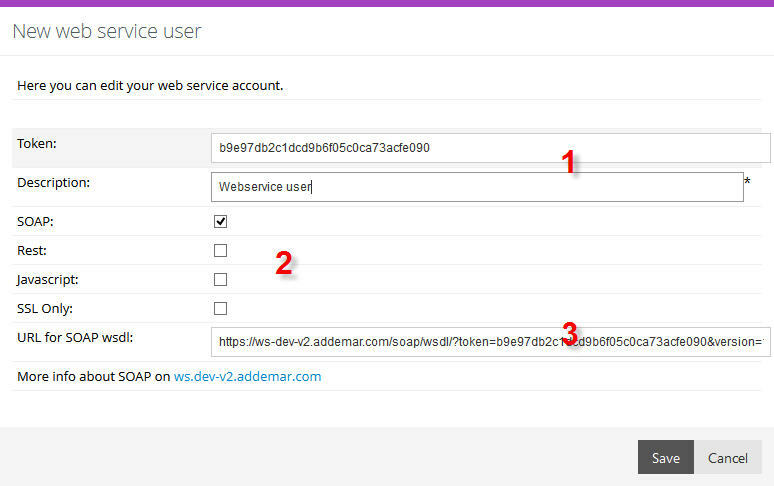 You can always check our API documentation at ws.email.addemar.com or contact us at support@addemar.com.